The seizure of City District Government Karachi (CDGK) accounts by the Sindh government pounded the last nail in the coffin of Karachi’s golden era. With the implementation of commissionerate system, all commissioners and District Coordination Officers will now have unlimited power to manage the affairs of the city. The announcement of restoring the colonial style of governance in 21st century has left many Karachiites shocked. Generally when governments depart, they halt new projects fearing credit-sharing. However, the former Karachi mayor, even at the time of leaving his post, made sure that the numerous projects initiated during his tenure continue in due course. By his action, he had proved himself to be the “Miracle Man”, who turned a messed up city into a truly beautiful megacity. During his 52-month-long tenure (1,560 days), 2,159 mega projects, each worth Rs 30 million to multiple billions, were completed. Besides, 337 big machines and logistics meant for various amenity works were also purchased. For the very first time not only the master plan of the city was prepared and given a legal status in the history, but the CDGK also completed 35 flyovers and underpasses; 356 parks; 194 water and sanitation projects; 316 major and supplementary roads and 451 educational projects. As many as 110 projects were completed in rural areas. In the transport infrastructure, 255 bus stops and 116 pedestrian bridges and a big car parking plaza were completed. On the other hand the tried, tested and failed commissionerate system which openly negates democracy to promote toadies, would reintroduce the monopoly of privileged class over the politics of the country. Interestingly this system is in no way functional in any of the country of the world. The people of Pakistan, especially in Karachi, have already witnessed what wonders local bodies system brought for them. It was the way for efficiently resolving the problems of the people at the lowest level, the system that had empowered the people who could easily access their representatives whenever they wanted. The commissionerate system in contrast would build up the bureaucratic infrastructure and further ruin the lives of commoners. The ruling party had comparatively an easier way to provide relief to the people of Sindh by continuing the successful local bodies system. People might have ignored the shortcomings of government if they were educated about the system that ensures betterment of their lifestyle. It is a time when the nation is being dragged back to the Stone Age. The media should bring the advocates of the commissionerate system to debates and ask them why the system engineered by the British does not even exist in the UK anymore. Anchorpersons should ignite a debate to educate masses about the benefits of the local bodies system and how it delivered. Indeed the local bodies system was introduced by a dictator, but the people of Pakistan extracted maximum benefit out of it and this is what “true democracy” is all about. The economic crisis which engulfed the world a couple of years back have appeared in Pakistan. The weakening economy is leaving its mark in every sector and the worst hit seems to be the Karachi Electric Supply Corporation (KESC) which was already a victim of corruption and a house of ‘ghost employees’ until the then President General Musharraf privatized the utility company to provide uninterrupted electricity to Karachites. The KESC fulfilled its promise and restructured the organization on revolutionary lines, from lodging FIRs against the electricity thieves to reducing the load shedding hours as less as 3 hours (comparing with rest of the nation facing more than 10 hours of load shedding). KESC took all necessary measures to turn the white elephant into productive organization. 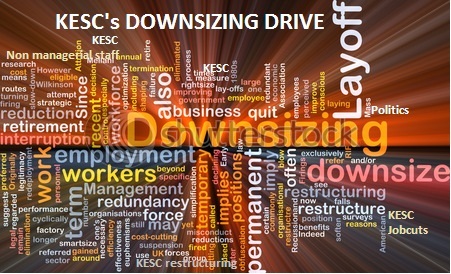 In an attempt to continue with restructuring and to make the company financially viable the KESC has decided to get rid of those employees who considered burden on organization as a result KESC is forced to lay off 4,000 of its unproductive workers, while 500 employees opted for Voluntarily Separation Scheme (VSS) under a cost-cutting drive. Most of the lay-off workers were from five different categories – security guards, bill distributors, sanitary workers, drivers and clerical workers who are offered one month’s advance salary and gratuity benefits as a result Collective bargaining agents and union leaders have rejected the policy and opted to confront the management by all means. With the passing days the KESC’s turmoil is increasing and the situation is getting more and more complex especially the scenario at the KESC Head office which is surrounded by a huge mob of sacked employees and their sympathizers representing the banners of several political parties. The live media coverage has managed to gain the support of the ill informed people of Pakistan who think in favor of the sacked employees considered as a liability by the utility company. Indeed KESC is not an employment bureau however in a highly polarized country like Pakistan where political parties literally find issues to exploit and make maximum benefit out of them; corporate likes KESC should have conscientiously handled this particular issue foreseeing the post decision chaos. At this point in time mass downsizing would be an unwise step by the company when the country’s economic situation is alarming and Government and all other political parties are trying to capitalize issues for gaining public sympathy. KESC’s step looks impudent, and the situation doesn’t seem to go in the favor of their decision to lay off the employees. Instead they must come up with “safe strategy” which could be implemented to achieve the objectives gradually. The company should pursuit the policy of downsizing but in a subtle and planned way which will leave very less scope for the labor unions to strengthen. As an alternative, the company should also revise the appraisals policy which could be determined by company’s profit or productivity measures. After restoration, all employees should be systematically included in the part of wage reduction program. It would not be fair to slash the wages of entry-level or non-management recruits only, such decisions will further spur discontentment among employees who were initially being targeted. However as soon as the wages are reduced with no security of appraisals, the non performing staff already working on less wages would definitely look for the soon-to-expire- lucrative Voluntarily Separation Scheme (VSS). In short the company should devise a smart strategy to divide workers unions with cost reduction plans which will definitely help KESC achieve productivity and its objectives in long term. Pakistan Muslim League-Nawaz (PML-N) leader and former Sindh Chief Minister Syed Ghaus Ali Shah has said President Asif Ali Zardari had made it clear to PML-N chief Nawaz Sharif in their meeting in Raiwind in July that he cannot press for the trial of the former President Musharraf due to his compulsions. It appears that the popular stance of Nawaz Shareef on dictator Musharraf seems to be fading away. N League were the only political party who were genuinely interested to try Musharraf on the breach of constitution and no doubt they had served all their energies to grill the dictator but lately a notable change has be seen in Nawaz Shareef’s behavior who now would not only allow democracy to prevail but respect each others mandate also according to the statement he has recently issued which means he will not demand for tyrant’s trial anymore. A sudden flexibility by the man of principles has surprised entire nation, not sure about repercussions of PML N’s “U turn” on their rising stature but the way they are subtly distancing themselves from Musharraf’s trial exposes the culture of Nawaz Shareef’s “principled politics”. The excuse PML N has come up with is they would only table resolution against ex Army General if PPP and other political parties support them otherwise the proposed resolution will be a waste that would ultimately benefit Musharraf. The phenomenon of being skeptical about democracy by its very custodians often amazes me yet they did it again. How on earth Nawaz league could go against the basic theory of democracy when it comes to fulfillment of their own interests. In democracy voice of the nation should be given respect and being the most popular party of Pakistan N league should not hesitate to submit resolution against the dictator. Expecting support or opposition should be left on the parliament depending upon the fairness of plea. If Nawaz league is confident on their stance and Pakistanis really take Musharraf as usurp (as Shareefs claim) – N league would be backed by the democratically elected parliament but the pressure building tactics on other political parties to turn results in their favor is against the basic theory of democracy. The core objective of presenting resolution in parliament is to try Musharraf in court with the will of people of Pakistan but the same N league who won the elections against dictatorship is hesitant to “rely” on democracy this time and are afraid of tabling resolution in the parliament with the fear of being disapproved which not only demonstrates dictatorial mindsets of Shareef brothers but also these actions are against the glory of Pakistan’s most popular party. There has been a lot of talk about the Taliban who publicly whipped a teenage girl in a medieval fashion on the charge of her being involved in “illicit” relations. .According to the video running on Youtube and on our local media these days, the girl wearing red dress was forced upside down on the floor and was seen harshly whipped on the hip by 3 bearded Taleban. Local people said that this 17 year married woman was punished for illicit relations and this incident had taken place six months ago in Kabal area. This controversial video has lately made us realize how violently the so called Shariah in the name of Nizame Adl [Law of Justice] is exercised in the most beautiful part of Pakistan. The place which was once known as heaven for the world has now turned into a hell. Those illiterate jihadi-mullahs and the so called custodians of Islam have been penetrating into rest of the parts of Pakistan to force their version of Shariah which could be more devastating in future. On the other hand a common Pakistani is simply stunned and still trying to figure out what kind of Islam it is and more importantly why nobody’s stopping them. The Talebani Islam which lacks tolerance and peace has been rapidly growing and maligning the religion on all levels it is also giving room- to- criticize to those people who already have issues with Islam. Islam never allows to brutally whip or stone someone in the name of Shariah, there are prerequisites of Shariah which need to be followed before penalizing someone. I wonder why this inhumane Talebani way of Islam is not being exercised in the countries like Saudi Arabia, Iran, Sudan etc though I don’t agree with their laws yet in our part of the world they have touched the height of barbarianism. Fortunately we the third generation of Pakistan are well aware of our shining past, the moderate nature of Pakistanis and rich culture but have we even thought what we are sowing for our future generations, what would they experience ? For the sake of saving future of Pakistan we the people of Pakistan must come forward and reject the theory of Taleban at least from our areas by keeping a strict check on what’s happening around, through Madarsah reforms and suspicious religious activities. We must not let Taleban state-of- mind grow and this can only be happened when we collectively discourage this sick mentality on all levels. Today they are in Swat tomorrow they will be in Karachi. We have already started receiving signals in our metropolis sometimes through graffiti and sometimes through strange phone calls. Our law & enforcement agencies should take immediate notice to the atrocious activities in those areas and tackle them with force. Now things have gone beyond dialogue process.